I visited an old friend on the weekend and that inevitably leads to late night critiquing of B horror movies. Watching old horror movies is a lot of fun. Watching old horror movies with someone with whom you can make snide remarks is just about perfect. This time around we selected two films to occupy our time: The Brotherhood of Satan (1971) and, from Hammer Films, 5 Million Years to Earth (1967). 5 Million Years to Earth was, by far, the better of the two films. That doesn’t necessarily make it the most enjoyable to watch or the best to write about but it has a unique premise worth a second look. 5 Millions Years to Earth is based on the British television serial Quatermass and the Pit (1955). In fact, in Britain the film was released under that same title. 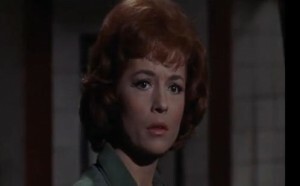 The film is part of a series of three movies all with the character of Professor Quatermass as the main protagonist. The other two films in the series were also based on television serials. Before getting into the story, I have to comment on the opening credits. The credits played alongside an image of an eerily lit skull. Not only is this rather generic, it is completely at odds with the film it is introducing. Skulls do come up in the story, almost right away in fact, but they are certainly not integral to the plot…and do not look like this skull. These opening credits seem more appropriate for a monster/ghost story than the alien invasion film we are about to see. 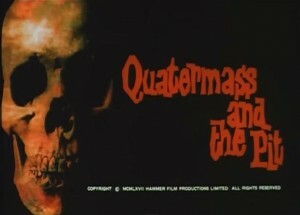 This title card is from the British release but the North American version used the same skull. A very unconvincing discovery. 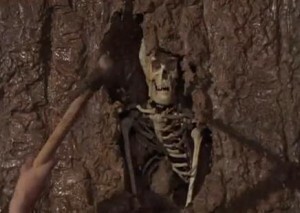 The rest of the bones have to be dug out of the muck. This one was kind enough to stand upright in a large air pocket. Roney decrees the find to be very valuable to science although when asked how valuable he responds, “I can’t tell yet but I do know this is one of the most remarkable finds ever made.” Dr. Roney believes that the remains unearthed prove that creatures resembling humans walked the earth five million years ago which is much further back than currently accepted. Roney admits he can not prove that claim but rather it is his ‘personal conviction’. This will be a running theme as every expert in the film seems completely comfortable jumping to conclusions or concocting complex theories with little basis on facts. When asked if he can hypothesize what these ancient creatures looked like, Roney goes one step farther. 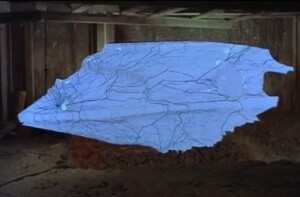 Not only is he willing to go on record describing the physical appearance of the creatures but he has already had a plaster model made and brought down into the Underground to show off. "They fit into the known pattern of evolution. The only odd thing about them is the great size of the skull." Doesn't that imply that they don't fit into the known pattern? As Roney is making a plea for more time to investigate before work on the Underground continues, something else is discovered in the mud and clay. It looks like fibreglass but it is implied that it is made of some unidentified, non-magnetic, metal-like substance. Believing it to be an undetonated German missile from WWII, the authorities call in a bomb disposal unit. 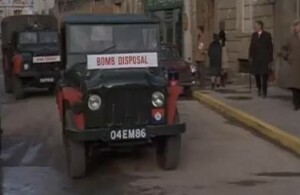 Do bomb disposal units really drive around with placards advertising themselves on their hoods? 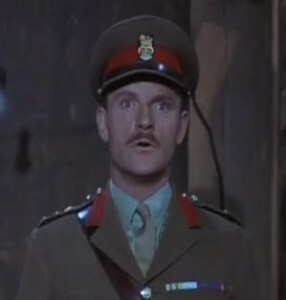 The head of the bomb disposal unit, after some gentle but unjustified criticism from Dr. Roney, calls for more experienced support from a Colonel Breen (classical actor Julian Glover). I can’t help but think that Breen was the inspiration for Graham Chapman’s “The Colonel” character on Monty Python’s Flying Circus. Colonel Breen drags our main protagonist, Professor Quatermass, along on his visit to the pit. Quatermass is the head of a government funded ‘Rocket Group’ dedicated to exploring the peaceful uses of rockets, whatever those might be. When Breen receives the call to come to the pit, he and Quatermass are arguing over plans to subjugate the Rocket Group towards the placement of military bases on the moon. It is Quatermass who first recognizes the thing in the pit as what it is clearly meant to represent, an alien spacecraft. To be honest, it looks more like a speedboat than anything else. You probably expect to learn that the humanoid remains were those of aliens that arrived in the spacecraft but no. This movie aspires to something much more. The craft shows neither signs of a propulsion system nor any means of accessing the interior. Attempts to drill their way inside with a Borazon drill have no effect. No effect, that is, except for a lot of amusing facial expressions brought on by the vibration. "I think I just swallowed all my fillings." Then, when they have given up on ever penetrating the thing, one wall of the craft starts to melt or shatter or something of its own accord revealing four alien corpses within a crystal honey comb. The corpses look like nothing so much as large rubber grasshoppers with three back legs. They start rotting upon contact with the earthly environment and release avocado dip when dissected but otherwise are quickly put aside. Quatermass combines the alien corpses, the humanoid remains, and local reports of poltergeist activity into an incredibly complicated theory that is all the more incredible for being correct despite it being entirely conjecture on his part. He and Dr. Roney somehow conclude that the physiology of the large grasshoppers matches the environment of Mars five million years ago. 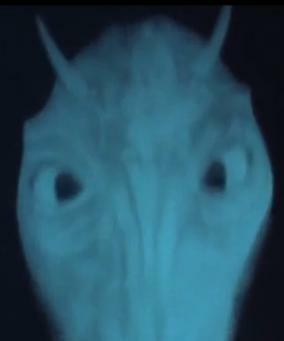 Quatermass speculates that Mars was dying back then and therefore the aliens attempted to colonize Earth. However, being unable to survive in Earth’s environment, they instead chose to collect a bunch of apes, bring them back to Mars, conduct genetic engineering on them, and return them back to Earth as a sort of ‘colonization by proxy’. There doesn’t seem to be any benefit to doing this for the aliens. Perhaps it is just bloody-mindedness. 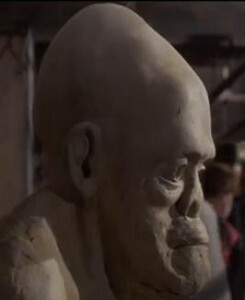 The mutated apes are the large brained humanoids depicted by Dr. Roney’s plaster model and our ancestors. The genetic engineering resulted in their large brains and increased intelligence but also clairvoyance. This clairvoyant ability was used as a tool by the aliens to instil our ancestors with the same ideology and basic instinctual drives possessed by the aliens themselves. Clairvoyance (along with other psychic abilities) are dormant in modern man but are awakened by proximity to the spacecraft. This, Quatermass hypothesizes, explains the odd occurrences in the area both historically and during recent events. Dr. Roney's assistant reacting in her normal detached fashion while witnessing an act of telekinesis. 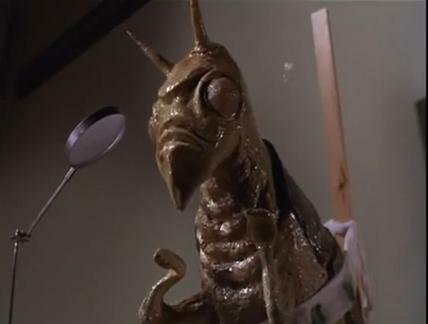 Incidentally, Colonel Breen’s counter-theory is that they are still dealing with a German missile from WWII but it was an experimental missile that was loaded with fake aliens and dropped on London as a propaganda weapon. This is rather far fetched but at least it isn’t as complicated as Quatermass’s argument. Quatermass decides they need to prove his theories in order to warn the military away from the alien spacecraft. He puts in a quick call to his pal Jerry who brings a mess of video equipment. They combine this equipment with a device Dr. Roney was using to record brain waves and create, of course, a means of recording images directly from people’s minds. "Don't tell me! You want me to buy a subscription to the Saturday Evening Post?" 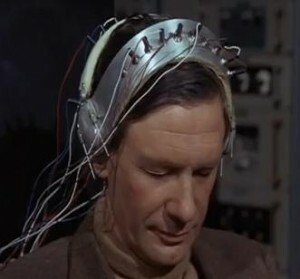 Professor Quatermass uses his new invention to record images of life on Mars five million years ago from the mind of Dr. Roney’s assistant as she has a clairvoyant episode brought on by the alien craft. Surprisingly enough the video depicting dozens of stick puppet versions of the rubber grasshoppers bouncing around does not convince the authorities. 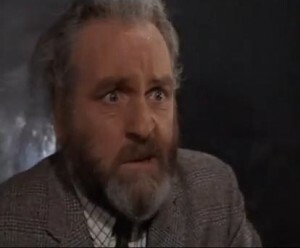 It does, however, give Quatermass fuel to enhance his theories to include colony preservation, ritual slaughter, demon mythology, and living ships. Quatermass says this clearly shows two alien factions in a battle as one attempts to cleanse the 'hive' of the other. Eventually the danger to Earth, or at least London, is revealed. As Londoners around them go mad, Roney (who is fortunately immune to the alien effect) and Quatermass (who is stronger willed than everyone else) come up with one final, tenuous theory on how to save London. 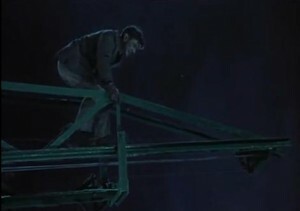 Roney puts a plan into action that hinges on climbing a giant crane and expecting to be able to control it merely by straddling it and rocking back and forth. 5 Million Miles to Earth is fairly engaging and the story is certainly ambitious. It is, however, a little short on action. For an alien invasion movie, it also has a decided lack of aliens or invasion. Eventually the aliens do kind of make an appearance but, when you are counting on an attack by an army of Bug Eyed Monsters, their arrival isn’t very satisfying.